bPlasma and Laser Spectroscopy Laboratory, Department of Physics, Universidad Simón Bolívar, Valle de Sartenejas, Baruta, Apartado Postal 89000, Caracas 1080-A. Venezuela. 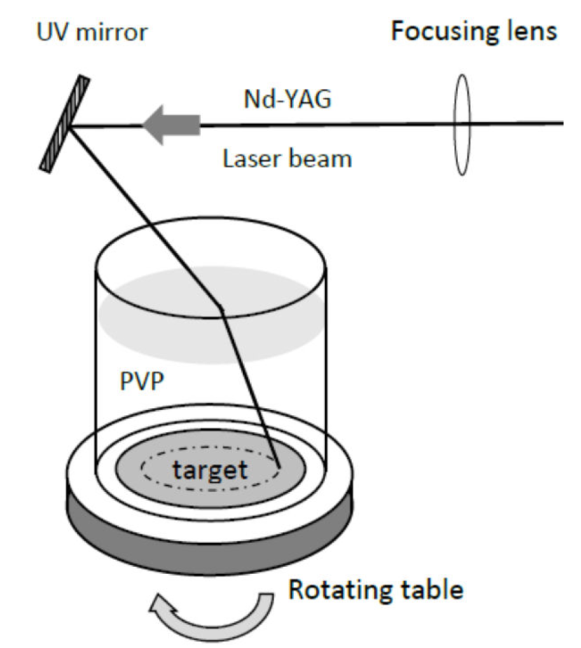 Pulsed laser ablation of Silver and Gold targets, immersed in a polymeric solution of Polyvinylpyrrolidone (PVP), is used to generate colloids and composite metal-polymer. Solutions of PVP in deionized water at different concentrations are employed. Two PVP number average molecular weights were considered, 10000 g/mol and 55000 g/mol. The high purity targets are irradiated between 20 min and40 min with the third harmonic (THG) ( λ=335 nm) of a Nd:YAG laser operating at a rate of 10 Hz with pulses of 8 ns. Optical spectroscopy in UV and vis regions, Scanning Electron Microscopy (SEM), High Resolution Scanning Electron Microscopy (HR-SEM) and X-Ray are used to identify and determine the shape and size of the produced particles. 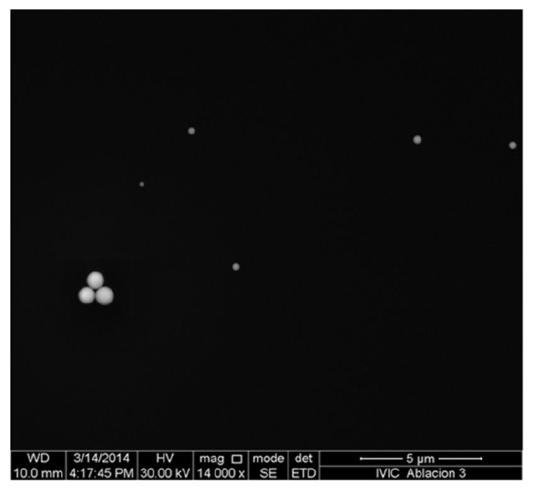 Very stable sub-micrometric spherical particles for Au/PVP y Ag/PVP samples are obtained with diameters of 0.72μ m y 0.40 μm, respectively. The preparation of colloids is performed in one step and no surfactant or dispersing agent is used in this process. Laser ablation, in its most simple form, is a technique in which a solid target usually placed under vacuum or in a gaseous or liquid environment is rapidly sublimated by the incidence of a high power laser pulse strongly focused onto its surface. In vacuum, the very fast expanding and far from equilibrium plasma plume generated can reach temperatures in excess of 104 K and pressures above 1 GPa 1. Also, it contains highly excited electrons, atoms, and molecules from the target that are ejected perpendicularly from the point of impact of the laser. When a solid metallic target immersed in a liquid solution is ablated by a laser pulse (LAL), high-temperature and high-pressure plasma is generated very quickly in the solid-liquid interface. Right after the laser pulse is absorbed by the target the plasma plume containing the ablated material expands into the surrounding liquid and a shock wave is emitted. During its expansion, the plasma plume cools down by releasing energy to the liquid environment. This process generates an expanding cavitation bubble which starts to oscillate and finally collapses. Induced cavity bubbles that are easily observed during the experiments play a significant role as a nanoparticle reactor 2)(3 in which an ultrafast growth of nano clusters takes place. LAL has been used in the development of nano and sub-micronized particles of Au, Ag, and Al 4,5,6,7 in water, Cu in acetone 8, and Ti and Si in ethanol and dichloroethane 9. The use of a polymeric solution as a stabilizing means has been reported10, but only after the generation of the colloids in ethylene glycol with targets of Ni, Co, and Ni/Co. We present a one-phase clean method to generate Au and Ag sub-micrometric particles in a polymeric solution of PVP in deionized water at different concentrations to eliminate eventual sources of contamination. The PVP, (C6H9NO)n, is a nontoxic and hydrophilic synthetic polymer that is used in medicine as a substitute for blood plasma and has applications in the pharmaceutical, textile, and food industries 11. The development of colloidal systems using a PVP solution as a liquid environment allows the improvement of its properties by the addition of some pure elements. Specifically, the addition of Ag particles in the solution yields relevant antibacterial properties 12. The generation of nanoparticles of Ag in an aqueous solution of PVP, using laser infrared radiation (1064 nm), has been reported 13. 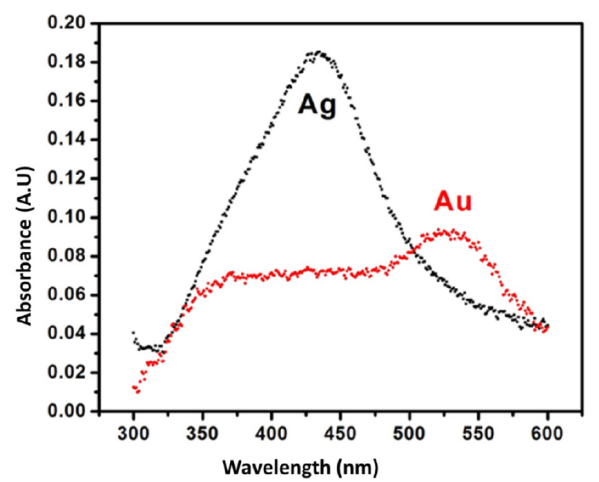 Due to its high stability, excellent biocompatibility, and special optical properties, Au nano clusters are widely used in biological and chemical sensors 14. In this research we have used ultraviolet laser radiation to produce the colloids and obtain from them the Au/PVP and Ag/PVP composite materials that can be preserved and remain very stable for periods of time up to six months. The basic experimental setup has been described previously 15 and is shown in Fig. 1. The container with the aqueous solution of PVP is a glass cylinder with a thin metallic target placed at the bottom. High purity (99%) thin discs of Au and Ag with a diameter of 31 mm are used. The whole system rotates slowly around its vertical axis during the ablation process in order to avoid the development of deep holes in the target, and thus maintain the same surface conditions for each laser pulse. The solution of PVP was obtained by dissolving the corresponding amount of the polymer, obtained commercially, in the required volume of deionized water. The source of radiation was a Nd:YAG polarized laser (Quantel, Brilliant B) operating in its third harmonic (THG) ( λ=335nm), emitting pulses of a duration of 8 ns at a frequency of 10 Hz. The beam spot on the target surface had a diameter of 0.5 mm and the laser fluence was 17 J/cm2 per pulse. The laser energy was monitored with an energy detector (Gentec, Model ED-200) and could be varied by properly delaying the Q-Switch system of the laser’s optical cavity. The duration of the ablation process, ablation time (t), for both metallic targets was between 20 min and 40 min, depending on the expected concentration of metallic particles. Using the standard suspension technique, one or two drops of the prepared colloidal solution were dried either on a pure carbon or a carbon-copper grid to characterize the morphology and size of the metallic particles. The use of these grids reduces the background signal arising from the substrate. Two conventional scanning electron microscopes were used in this work: one standard Jeol SEM 6390 and one high resolution FEI Inspect F-50. Optical absorbance of the colloidal suspensions were measured with an Ocean Optics UV 2000 spectrometer. The interaction between the laser radiation and the PVP/H2O solutions was minimized by seeking the suitable concentration that allowed the maximum laser energy transmission through the liquid medium. A rectangular quartz container with thin walls spaced apart by 10 mm was filled with different concentrations of the polymer solution for this purpose and the cross section of the laser beam was expanded to a diameter of 1 cm. Results for a concentration of 0.004 g/ml are shown in Fig. 2. No optical visible changes were observed in any of the solutions exposed to the laser. 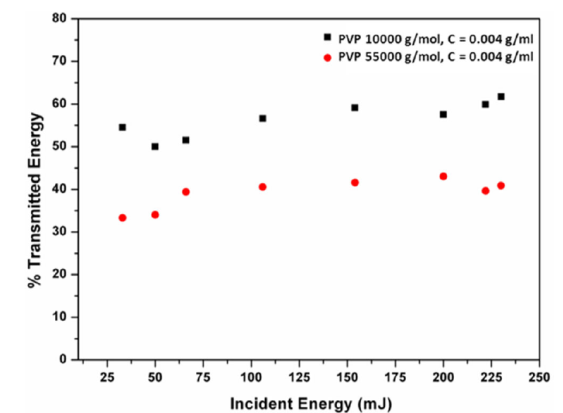 Figure 2 Relative percentage of transmitted laser energy for two different PVP molecular weights: 10000 g/mol and 55000 g/mol and a fixed concentration of 0.004 g/ml. The color of the colloidal suspensions obtained in our case are the characteristic ones due to the presence of Au and Ag sub-micrometric particles as has been reported elsewhere16. A yellowish colored solution corresponds to the presence of Ag particles while a violet color solution is due to the presence of Au. The color intensity of such colloids depends on the concentration of particles present in them. Figure 3 shows the different colors of some of the colloids produced in this work. Figure 3 Characteristic colors of some of the generated suspensions. (A) Pure PVP/H2O solution. (B) PVP: 55000 g/mol, and 55000 g/mol, Ag. (F) PVP 10000 g/mol, Au+Ag. (G) PVP 10000 g/mol, Au+Ag. In all cases V= 12.5 ml, ablation time 40 min. The coloration of the solutions is the result of the coherent oscillation between the electrons of the conduction band and the electromagnetic field of the visible light for each metal; Surface Plasmon Resonance (SPR) effect. The absorbance spectra measured for our laser generated suspensions exhibit the typical bands for Ag and Au in the wavelength range between 320 nm and 600 nm, with a maximum around 435 nm for Ag and 530 nm for Au. (see Fig. 4). Specific characteristics of each of the optical absorbance measurements depend upon the particular metal that forms the colloid as well as on the concentration and size distribution of the colloidal particles. As for their general features, these results are similar to those already reported 4 in the generation of Ag and Au colloids by LAL in distilled water. Figure 4 Absorption spectra from colloidal solutions of Ag/PVPdeionized water (black dots) and Au/PVP-deionized water (red dots). Molecular weight of PVP: 10000 g/mol, V = 25 ml. Laser ablation time: 20 min. Samples of composite material metal/polymer were prepared by adding 1 g of PVP to 1 ml of the laser generated colloidal solution mixing them until a homogeneus liquid was obtained. The mixture was poured in circular molds and was let to dry over night at room temperature. Figure 5 shows the discs of Au/PVP (violet-shaded) and of Ag/PVP (yellowish) and the colorless pure PVP matrix. In spite of being hygroscopic, these composite materials might be used as optical filters. Depending on the molecular weight some can be dry and rigid. Figure 5 (a) PVP Matrix. (b) Au/PVP Composite Material, and (c) Ag/PVP Composite Material. For (b) and (c) PVP 10000 g/mol. In all cases V = 6 ml, ablation time 40 min. In order to verify the role of the PVP as a good dispersing agent, LAL of the same Au and Ag targets immersed in pure deionized water. Since in this case the liquid is practically transparent to the UV laser 15, ablation times of only five minutes were needed to compare the developed colloids of Au/PVP and Ag/PVP against the samples of Au/H2O and Ag/H2O. The results of SEM analysis for both colloidal suspensions in pure water are shown in Figs. 6 and 7. 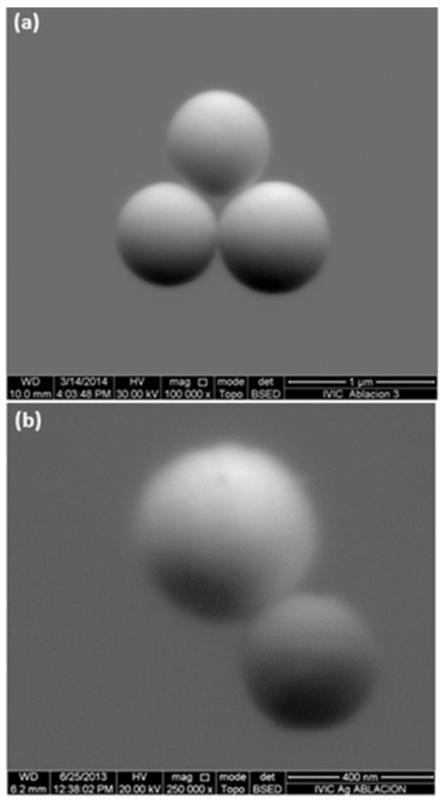 From these micrographs, the formation of a metallic phase made up of particles of quasi-spherical morphology with an average size of 0.53 μm for Au and 1.10 μm for Ag. It can be seen that there were no agglomeration effects present when the ablation was performed directly in the polymeric solution. Figure 6 SEM analysis for Au/H2O and its respective EDX spectrum show composition of the dispersing media. 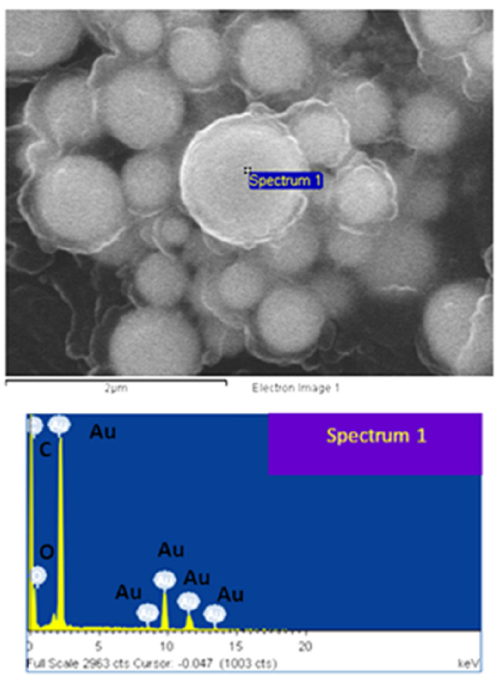 Figure 7 SEM analysis for Ag/H2O and its respective EDX spectrum. For the Au/PVP system, see Fig. 8, SEM images show a greater dispersion of metallic particles in comparison to the system Au/H2O. Figure 8 PVP 55000 g/mol, V = 6 ml, Au, t = 40 min. Three variables were taken into account for the development of the colloids: ablation time, used target, and molecular weight of the PVP polymer. The first and second variables did not show significant differences. SEM micrographs of Au/PVP and Ag/PVP colloidal samples (Fig. 9) show a perfect spherical shape for the laser ablated material present in the suspension. Sub-micrometric particles with an average size of 0.70 μm for the sample of Au/PVP and 0.40 μm for the sample of Ag/PVP were obtained. The time of ablation had no effect in their morphology. Figure 9 SEM micrographs (a) Au particles in PVP 55000 g/mol, V = 6 ml. Ablation time 40 min. (b) Ag particles in PVP 55000 g/mol, V = 25 ml. Ablation time 20 min. EDX spectra show that C and O are the only present elements in both Au/PVP and Ag/PVP colloidal suspensions, a clear evidence that no contamination in the generated samples during or after the ablation process. See Fig. 10. Figure 10 EDX Spectrum corresponding to the PVP = 10000g/mol. Laser ablation of Ag and Au solid targets in a solution of PVP dissolved in deionized water reveals a direct, clean, and efficient method to develop colloidal systems and composite materials. Optical spectra and SEM analysis show that the PVP solution works as a good dispersing agent of the metallic particles. Sub-micrometric spherical particles are generated during the process; the sizes are 0.72 μm for Au/PVP and 0.40 μm for Ag/PVP. As reported by other authors, this is the first time it is done with a UV laser and also directly on the PVP. On the other hand, the laser radiation does not alter the properties of the polymer solution and no aging effects were detected in any of the colloidal systems over a period of eight months and optical absorbance measurements show that SPR effect is due only to the metallic particles present in the solution and the PVP liquid medium has no incidence on it. This work was made possible thanks to the funds provided by Project CDCH-UCV No PI-03-8197-2011/1. Also we thank Mr. G. Rodriguez, Microscopy Laboratory from Universidad Simon Bolivar, Venezuela and Prof. G. González, Engineering Center of Materials and Nanotechnology from IVIC, Venezuela for the SEM analysis.